It’s not often that you see a black woman directing a horror movie, and if Cursed Part 3 is any indication, you might never see it again. The director in this case is none other than actress Rae Dawn Chong, and while what I’ve seen of this movie is pretty bad, I’ll cut her some slack because the DVD I watched is not a movie; it’s a 20-minute director’s reel. So the question is, WHAT IS THIS DOING ON NETFLIX??? How ’bout a little quality control, people? Frankly, though, this movie looks so cheap, I doubt it’ll ever see the light of day, so I may as well review what’s available. 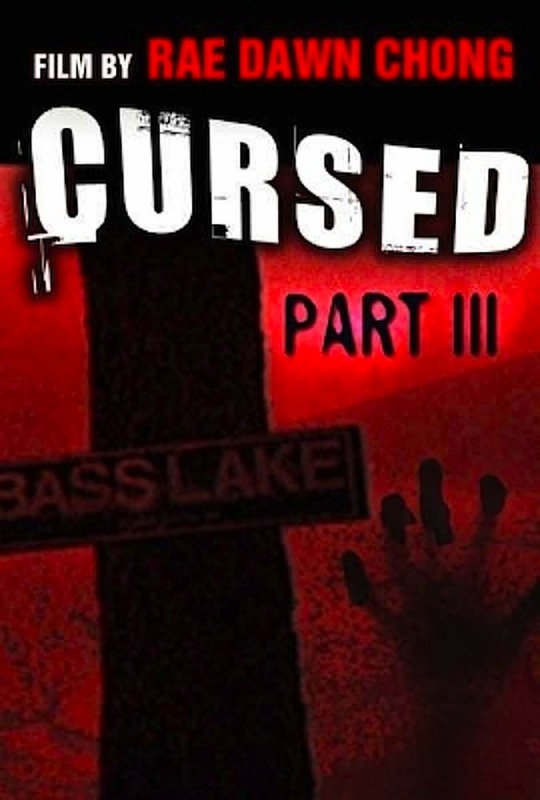 The plot centers around a low-budget horror movie being shot in the woods with a few actors, a director, a guy with a camcorder and a sound guy — which, it seems, is all that was involved with the making of Cursed Part 3 itself. Not surprisingly, something lurks among the trees, although we never get to see what it is, and it never kills anyone (at least, not in director’s reel). I assume there’s a curse of some sort involved — maybe three? — and judging from one questionable scene, it might involve one character’s vaginal excretions (ewww…). Much of the 20 minutes is taken up by “witty” banter that makes it clear that this film is meant to be more comedy than horror. The humor is sketchy at best — the only thing that got a rise out of me was the use of the phrase “poo balls” — and with the low, low production value, Cursed Part 3 has the feel of a corporate training video…with T&A. Normally with a project this cheap, I’d say that the acting is terrible, but it’s actually not bad here. Understandably, Chong is able to gather up a team of respectable performers, including veteran character actor Cylk Cozart (who’s, like, 50 playing 20?) as one of the cast members and Ben Reed — whom you might remember from some Old Spice commercials — as the cameraman. I’d have to see the entire thing to tell if Cursed Part 3 is as bad as it seems or if it’s so bad it’s, er, not horrible. This scene makes more sense if you have a widescreen TV. As they stared into each other’s eyes, they couldn’t help but wonder what the hell they were doing. It was all fun and games until Tim woke up the next morning with saddle sores.